There are a wide range of potential applications for the Sagitto system. For example, Sagitto can be used to quickly measure key parameters in a wide variety of hydroponic and outdoor crops, through a rapid scan of plant leaf material. And plant breeders are using it to speed their trials and identify valuable new phenotypes faster. 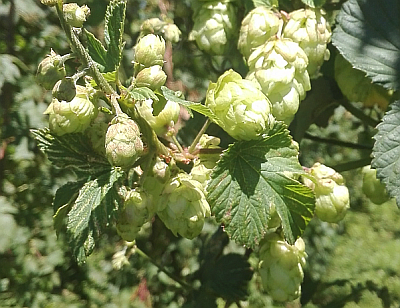 The female flowers - or 'cones' - on hop vines are rich in terpenoid essential oils and terpenophenolic resins. These compounds give hops their characteristic bitter flavour, and also impart a wide range of distinctive aromas. 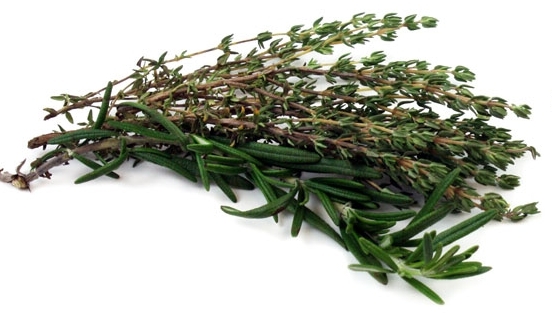 Click here to see an example model developed for Hop Products Australia. 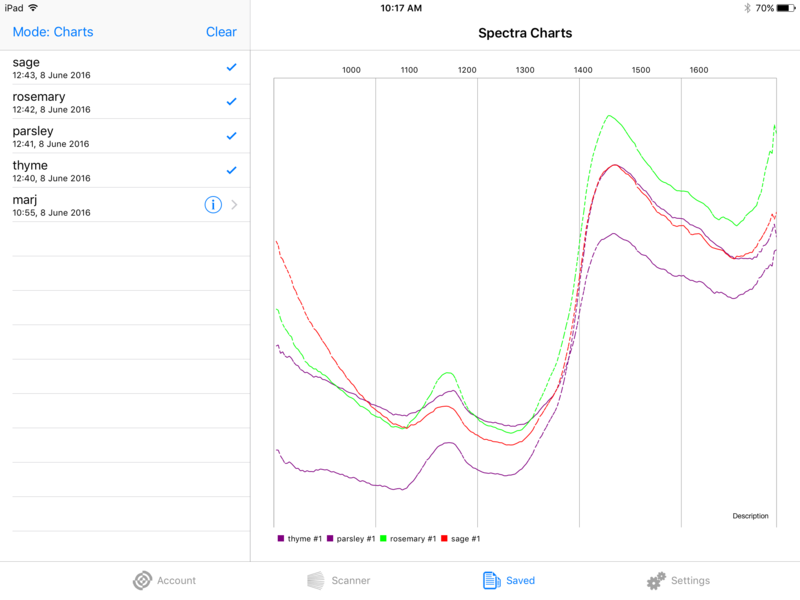 "Sagitto’s system of miniaturised, portable NIR, paired with their data science service has presented HPA with the opportunity to reduce turnaround times for sample analysis, and will significantly reduce the use of organic solvent for the brewing industry standard hop acid analyses required to manage harvest and processing of our hops. With Sagitto’s data science service the predictive models are living entities, which allows us smoothly integrate model maintenance into our calibration system so that the analytical output is of equivalent quality to established brewing industry standard methods of analysis. Sagitto have demonstrated quality, flexibility and awesome turnaround times for model generation and revision. " This model classifies ground coffee beans according to the coffee roaster, and the batch. It is not a very useful model in itself, but it does illustrate how near-infrared spectroscopy can be used by more technically sophisticated coffee roasters to ensure that they produce an objectively consistent product. Many specialised coffee roasters change their blends according to availability of particular beans. 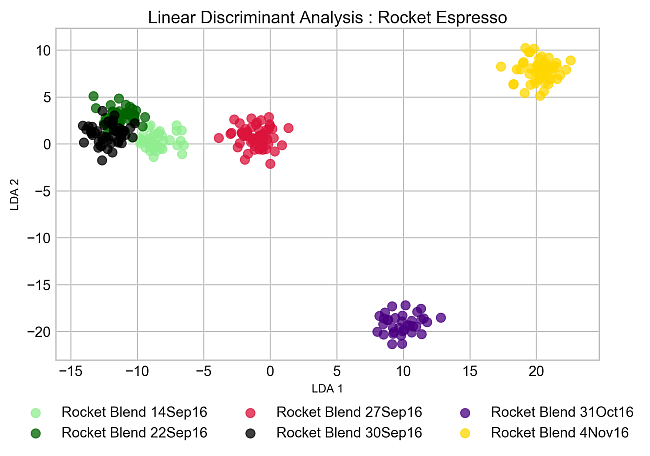 For example, the graph at left shows how the 'Rocket Espresso' house blend at Rocket Coffee changed when they altered the mix of beans in the 31 October roast, and then again when the blend was changed for the 4 November roast.